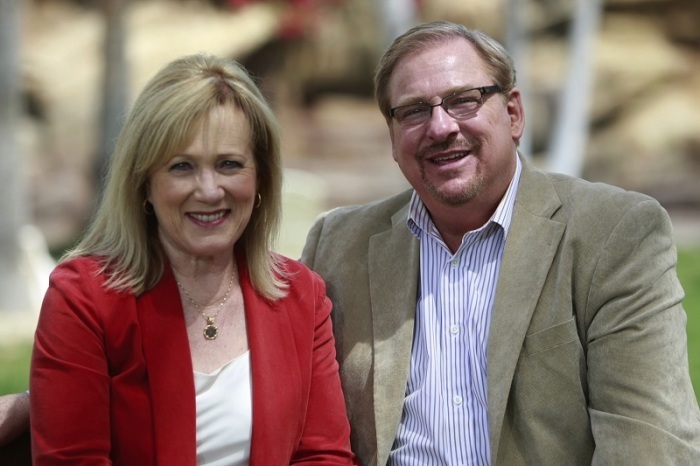 LAKE FOREST, Calif. — Rick and Kay Warren launched Saddleback Church's second Gathering on Mental Health and the Church on Thursday morning with a call for faith communities to take the lead in caring for those with mental illnesses. In the opening session of the conference, Rick Warren, Saddleback's founding pastor, argued the church had a biblical, historical and practical responsibility to make a priority of caring for those with mental illnesses. "Churches are typically the first organization families in pain reach out to," Warren said. "When a family is having a mental-health crisis, they don't go first to their lawyer. They don't go to their accountant. They don't even go to the police or the doctor or even the principal. Usually, the first person they call is the church." The Warrens' message concluded the opening session of the conference. More than 2,200 people participated in the first day of the conference on the Saddleback campus. Nearly 4,000 watched the conference for free online. The Warrens started the conference in 2014 after their youngest son, Matthew, died a year earlier following a lifelong battle with mental illness. Every person has dignity because they are made by God, they are made in God's image and they are made for God's purposes and for God's glory. In our fallen, imperfect world, all of us are broken. Even though we're broken, we're still deeply loved and deeply valuable. We get well in community. Kay Warren followed up her husband's message by emphasizing the need for the church to befriend the mentally ill. She reminded the audience God loved them even when they were at their worst. The radical love of God toward them should transform how they love and befriend the mentally ill, she added.